Your name is Danny Carter. You’re a happy man: you have a good job, and share a Chicago greystone with the woman you love. Life is better than you ever dared hope. But things weren’t always this way. Seven years ago you stood in a dark room over the bleeding body of man writhing in agony. You’ve prayed every day that your past would stay buried…because you weren’t alone in that room. Now, the man who stood beside you is back. He’s the most dangerous person you can imagine — and he’s demanding you help him do the unforgivable. Agreeing might cost your career, your relationship, even your freedom. Refusing will cost your life. 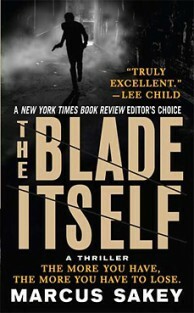 REVIEW OF MARCUS SAKEY'S "THE BLADE ITSELF"